The end of August brings a lot of things. Hotter temps, vegetable harvests, slightly-yellow leaves and rain (especially if you live in Houston). It also signals the beginning of back-to-school season, and this year is a very special one in our household. We have a high-schooler! Maybe it’s because we live in a larger city than when I was her age, because I can’t get over the tools and resources that our oldest now has access to. Brand new instruments for the state’s largest marching band, construction of an entire addition for the music department and another gym and after-school programs for nearly every interest! We’ve lived through an era of cuts to “non-essential” programs at most schools and we know we’re fortunate to reside in a district that not only hasn’t felt the need to disband their arts programs, but found a way to nurture and expand their programs. Both of our girls should benefit greatly. At our first open house last week we got the chance to tour the classrooms of our new underclassman. One room in particular stood out – her science lab. It took me by surprise that it looked exactly like mine from 35 years ago. There have been so many advances in science and technology over the past three decades, and I couldn’t believe it wasn’t reflected in her classroom. The only thing different I noticed was the absence of a blackboard – replaced by a standard whiteboard and overhead projector. After inquiring, I discovered that at our school, science is split up into various courses, each with their own classroom. This particular one was for Earth Science, which explained the stacks of rocks and jars of dirt on the shelves. One course that Madison was particularly interested in wasn’t available to her as a freshman, computer programming. This really surprised me. Even back in the 1980’s, I took BASIC programming as a junior. With computers being commonplace today, I guess I expected her curriculum to be much more advanced when it came to technology. Quite honestly, I think programming fundamentals should be taught at the middle school (or earlier) level. I guess when you have a school so focused on the arts, sometimes the sciences are neglected. Don’t worry, I have our solution in hand. 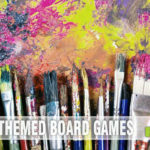 Hopefully by now you’ve followed our series of articles about ThinkFun and their line of puzzles and games. A few years ago when our girls expressed an interest in programming (“Daddy! We’ve got an idea for an app!”), we introduced them to Robot Turtles, a learning tool for kids age 5+ which introduced them to the very basic thought processes needed when creating a set of computer instructions. They mastered it within hours, which is to be expected since they were much older than the recommended age. 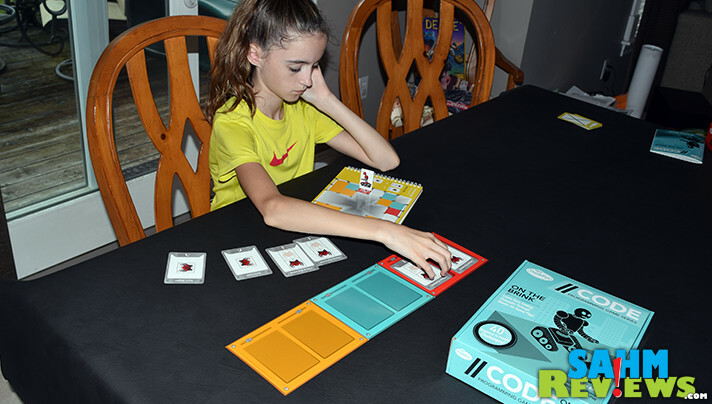 ThinkFun’s next entry into the line was Code Master. While suggested for ages 8+, I have to say some of the more advanced puzzles challenged me as well! The goal was to move your robot around a mine, picking up gems and getting to the entrance. Easy enough, except your code needs to be clean and compact. Code Master forced you to think about subroutines and maximizing efficiency, while still completing all of the challenges. 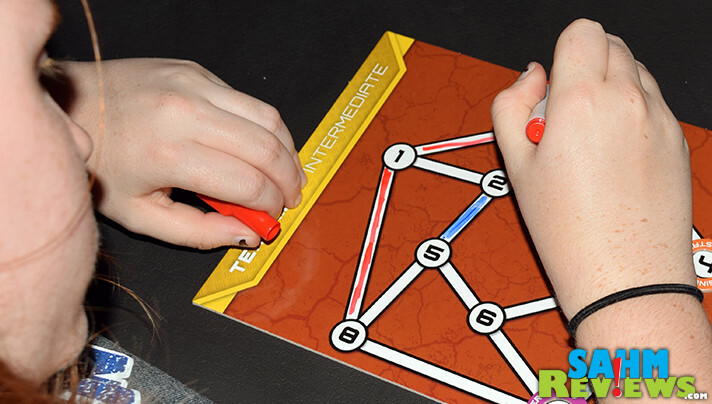 This year ThinkFun has introduced a brand new series of games which takes the puzzles to another level. CODE Programming Series is a Target-exclusive product and currently has three different titles. Each one focuses on one type of task to be performed and you must figure out how to accomplish it in the most efficient manner. 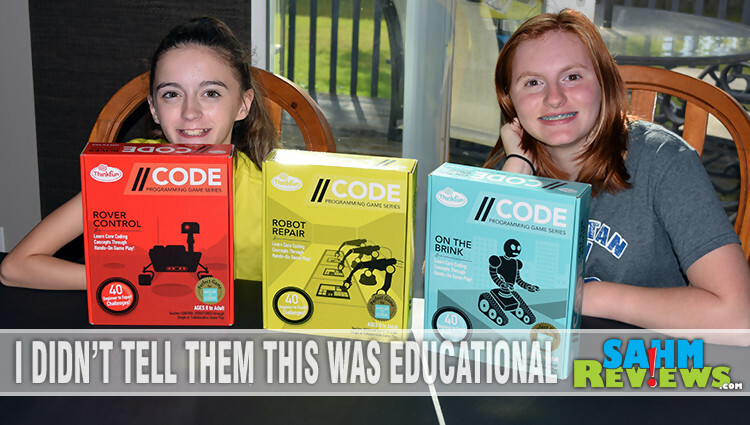 They are also perfect solutions for anyone participating in the international Hour of Code movement! All three titles operate in the same manner as Code Master. 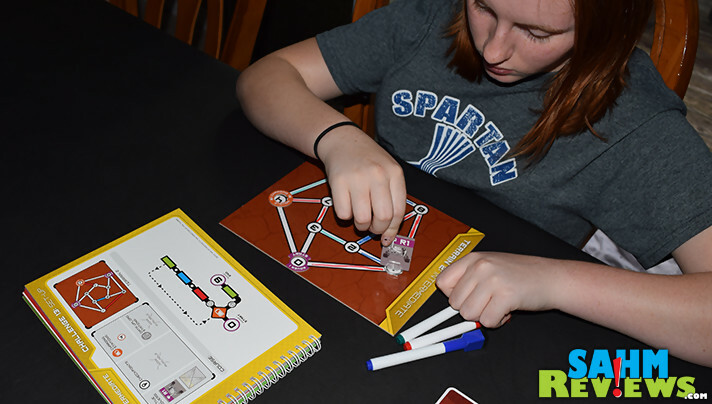 You have a book of 40 challenges of ever-increasing difficulty, along with a solution manual, game boards and accessories. 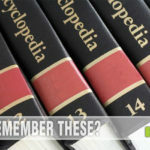 ThinkFun has managed to squeeze quite a bit of content into a $15 box! 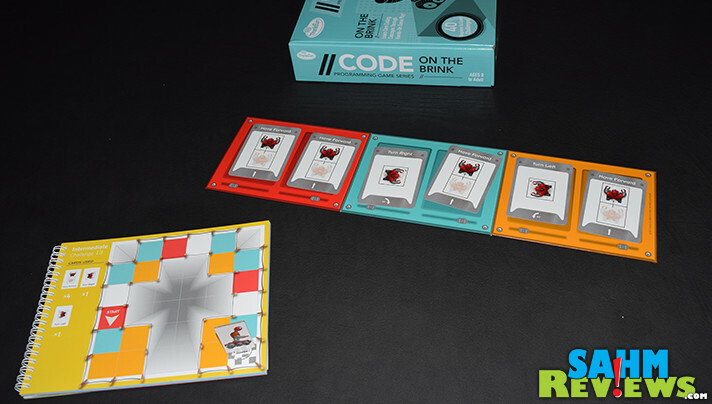 Probably the easiest of the three games, CODE Programming Game – On the Brink is no walk in the park to solve. It is only because of the use of cards and a quick setup that we would recommend this version as a starting point. The goal of each challenge is very simple – get your single robot to the finish by programming its moves. Each challenge gives you a number of cards to work with along with a map of the path the robot must take. 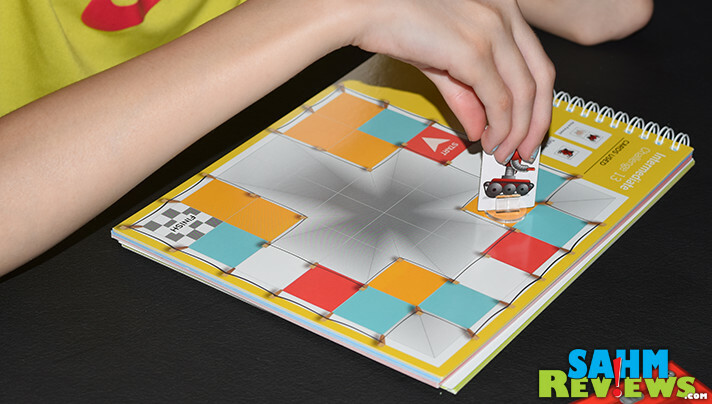 The robot’s moves are dictated by the color of the square in which he is standing. 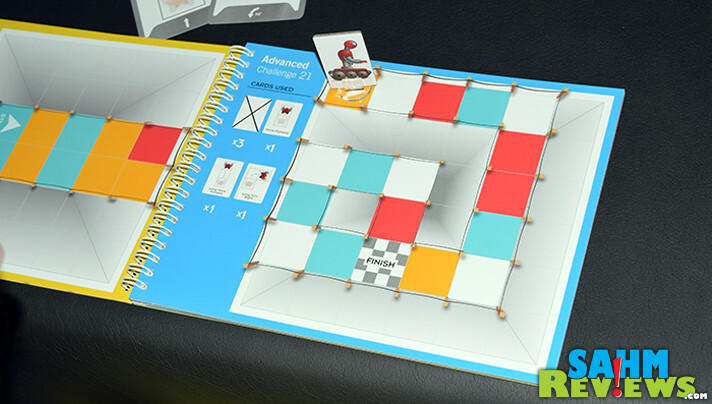 The included game board is divided up into the three possible square colors and you must place two card into each section. In order for the robot to move, you must resolve both cards in that section! Moving off the path or landing on a white square means your robot is stuck (and your solution is wrong). On the Brink is introducing you to subroutines, only you don’t know how many times each must be performed. Or in which order. That is, until you start moving – then you’ll understand how they interact with each other. Puzzle #13 (an intermediate example), we used four “move forward” cards, one “turn right” card and one “turn left”. Taking note of the white spaces immediately after the red spaces, we correctly guessed that we would need two of the “move forward” cards in the red section. Each blue section required a right turn before moving forward one, and the orange sections were similar in that they needed a left turn and then a step forward. By setting up the routines in this manner, our robot was able to make it all the way to the end of the map without fail! Of course this was just the intermediate level. Later levels have many more loops, double-backs and might not even tell you which cards you will need! I’ve always though it would be cool to remotely control the Mars rover. They wouldn’t dare give me the controls because I’d probably do nothing more than create Martian donuts visible from space. With the Rover Control version of the CODE Programming Game Series, the surface of Mars is safe from my immaturity! In this version we take control of up to two rovers which have been sent to Mars to explore forty different courses across four types of terrain. Previous rovers set down colored segments to mark their paths, but dust storms have covered some of them. Given only a partial solution, you must figure out the correct paths for the rovers using the map and programming information provided. 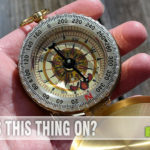 In this quick example of an Intermediate puzzle you are only given a couple colored paths to work with and programming that has two routines – one for when you pass over a charging station and one where you don’t. You must follow the red/blue/green pathways and repeat them until you land successfully on the charging pad, which triggers the second routine of travelling along the green path to your finish. In this case, you will figure out that you must perform the first routine three times before making your way to the charging station! 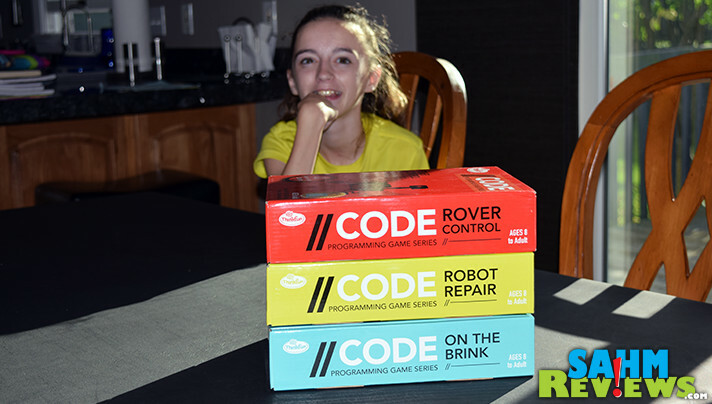 We have two relatives currently enrolled in the University of Iowa Electrical Engineering program and we have to wonder if they wouldn’t have had a head start if they had owned a copy of CODE Programming Game – Robot Repair. This version tackles electrical wiring of robots that need to be repaired and reactivated. Unfortunately all of their power cells have been removed, so it is up to you to re-power them by figuring out the correct placement of up to five batteries. Every challenge dictates the number of batteries used as well as criteria about which pathways should be active once powered. Again, using an intermediate puzzle as an example, we must use three power cells and verify that the blue wire does not receive power. 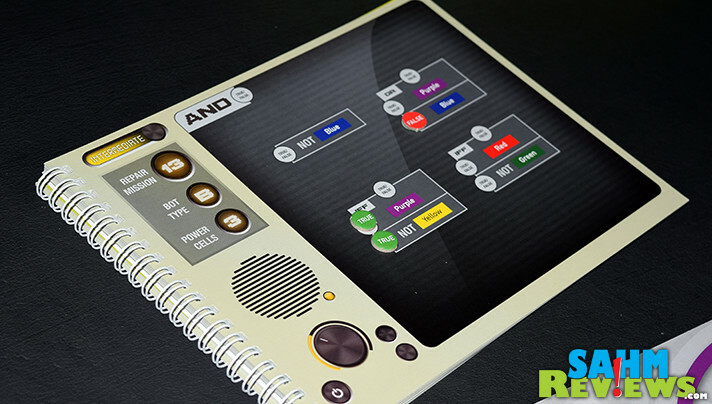 There are also two different types of “logic gates” in this particular challenge that must be overcome. An “OR” statement can only be completed if at least one of the underlying demands are met. In this case, it is valid if either the purple or blue lines are powered (or both), but since this conflicts with the first part of the challenge, only the purple one may be turned on. Two different “IFF” statements are also present. All underlying statements must be true or false, no mixing/matching. To solve this puzzle, the left-most “IFF” statement is resolved to be true, while the one on the right are both false. Confusingly, this means the green section is actually on, since the falsehood of being off is the opposite! Does your head hurt now?! We haven’t even gotten into “NOR”, “NAND” or “XOR” statements yet! Quite honestly, this CODE Programming Game Series is one of the best values we’ve seen in products of this type. 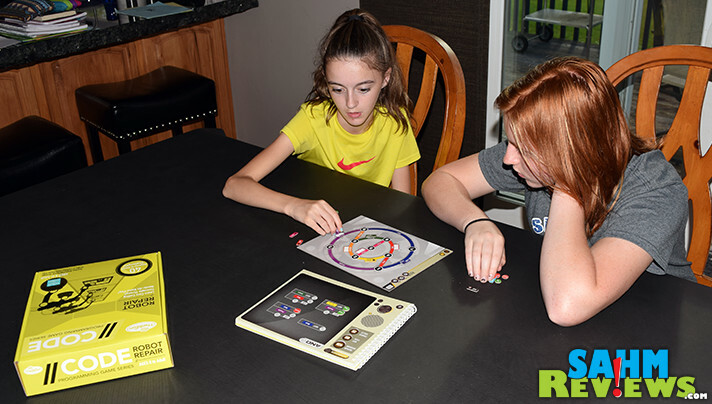 For only $15 each, you’ll have hours upon hours of puzzle time, and they can be replayed as many times as you wish (or shared with siblings). As mentioned, these are Target-exclusive products and are easily found in the toy section or on Target’s website. 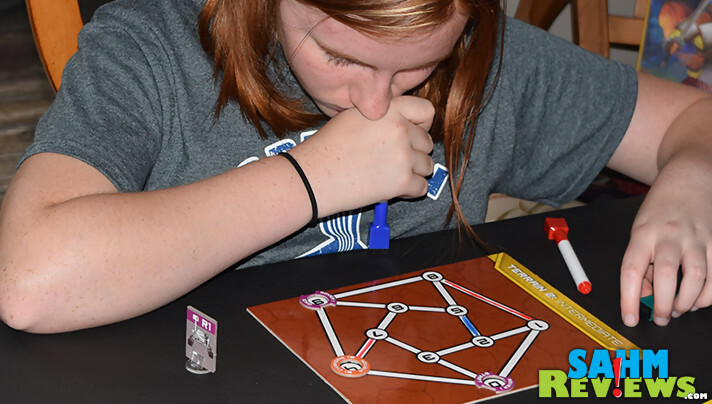 We’re hoping ThinkFun continues expanding this series and we’ll be watching their Facebook and Twitter timelines to find out if and when new versions are issued! In the meantime, enter to win your choice of one of these right now! 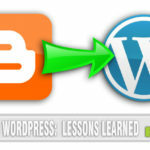 Program yourself to come back each day for more entry opportunities! My son enjoys doing robotic programming and all these look as though they are something he would enjoy. I think On the Brink would be a good starting point for my oldest kid. We’ve got Robot Turtle and I definitely want to encourage their STEM involvement. I would say CODE Programming Game – Robot Repair. Seriously people? Is this Santa’s wish list page? Aren’t comments supposed to be for people who have ACTUALLY played & or purchased the product? For example: I saw this product at Target tonight, and am now doing my “homework” on it, but instead of actual comments from people who have purchased it…its a dozen people saying they want to or would try.